Tad R. Brown is a 7th generation American craftsman who has been involved in music, art, woodworking, and guitars for over 30 years. His acoustic archtop guitars are specially made to crossover between jazz and flat top instruments. Hand crafted in California from premium solid tonewoods, exceptionally lightweight and responsive, for a wide dynamic range of rich tonal resonance. Dion Guitars is a one-man operation specializing in hand-crafted acoustic guitars. While the freedom of an independent craftsperson can offer a wide range of custom modification and design, the same belief informs every project: that the beauty of the acoustic guitar lies in the instrument’s essential function and that it should inspire use as well as admiration. Guitares Julien Sublet offers unique instruments made in Quebec City. Each and every instrument is handcrafted and fully customizable. Fred Tellier has been building acoustic guitars, Irish Bouzouki and ukuleles since 2005 from his shop in Windsor Ontario. He prides himself on being open to ideas from clients, and his goal is to create an instrument with sound, playability and finish that both the client and he can be proud of. Need to know: Perfectionist striving for perfecter. Woodaholic. Voted best luthier in my entire postal code by family members. Want to know: A life-long guitar player and woodworker, I had an epiphany to combine my two passions; so commenced my obsession with lutherie. To refine my skills and abilities I have trained under Sergei de Jonge and Meredith Coloma. Robert Godin is from Canada and grew up in love with woods and handcraftsmanship. As a teenager guitarist in the ‘60s, he wanted to recreate the music tones he heard on records, from such bands as the Beatles and the Ventures. He began experimenting with string gauges and guitars modifications while working at his aunt’s Montreal music store. Later, he had the opportunity to work for a luthier in Quebec where he found his passion. Robert eventually designed and perfected a style of building a guitar that could produce unique sounds. Today as the owner and founder of Godin Guitars, Robert oversees the operations of six guitar factories, five in the Canadian province of Quebec and one in the US state of New Hampshire. With the head office based in Montreal, Quebec, Godin Guitars is the largest manufacturer of guitars in North America employing 600 people. The company started out as a small guitar shop in Montreal in 1972 and has grown into an internationally renowned guitar company with distribution in over 65 countries. Known for innovation and value, The Godin Guitar Company brands include the Godin electric guitar line and five acoustic guitar lines: Seagull, Norman, La Patrie, Simon & Patrick, and Art & Lutherie. Godin Guitars is also the manufacturer of the revolutionary TRIC guitar cases and is the distributor of Acoustic Solutions amplifiers in Canada and the US. The Godin Guitar Company was recently named the 2014 supplier of the Year by the music products industry trade publication, Music Inc. and has been recognized for product excellence numerous times by music retailers worldwide. Growing up on a farm in rural New South Wales, Australia I started my woodworking journey at a very young age with my father, who is a trained wooden boat builder and traditional timber framer. I then started building guitars at the age of 15 when I apprenticed with violin and classical guitar maker Graham Caldersmith. Using the knowledge that I accumulated during my seven year apprenticeship under Graham, I have gone on to create my own acoustic steel string and classical guitar designs. Utilizing modern bracing techniques, acoustic resonance tuning and a clean defined aesthetic. I am currently living and building instruments in Vancouver, Canada with my partner Celina Jactino and our first beautiful boy Koa. Jeremy Hamm (Hamm-tone) grew up in southern Ontario's Niagara Penninsula. His father, Nicholas Hamm III, was a mechanical engineer for John Deere for 30 years, and his grandfather was the mandolin player for the original "Lincoln County Peach Pickers", the first recorded bluegrass band in Canada from the early 1950's on. It was only fate that he fused his two strongest character traits, mechanical ingenuity and musical intuition, to become a popular and successful guitar builder in Canada. From an early age he took piano lessons, then began studying the classical violin at age 7 until the end of highschool. Playing in the Niagara Youth Orchestra, high school jazz band, concert band, numerous bluegrass, country and rock bands, his musical knowledge runs deep. He is not only a respected luthier, but a respected musician in the Canadian music scene. Luthier Michael Kennedy of Indian Hill Guitars strongly believes that a cohesive design in both structure and aesthetics is fundamental to producing exceptional world class instruments. These ideals could most succinctly be described as 'clean elegance'. Michael's approach to achieving these tonal and visual goals has continually developed over the course of his career but is rooted in the melding of science and instinct. With a formal education in Mechanical Engineering from Cornell University tempered by a life spent pursuing creativity he strives to not simply keep these forces in balance, but use them collaboratively to create something greater than the sum of its parts. Michael began building guitars during a three year apprenticeship with Sergei de Jonge and currently works in Montreal as part of the Mile End Guitar Coop which he co-founded in 2008 with Jeremy Clark of 52 Instrument Co.
Building one-of-a-kind, masterfully crafted, amazing sounding, acoustic guitars has been a life-long passion for Wayne Irvin Johnson. Having played guitar since he was 6, Wayne has developed an ear that really helps him voice a guitar that is rich, deep, wonderfully balanced, with sustain that seems to just hang in the air. He met James Olson in 1995 and was smitten with the idea of building guitars. Years later he attended Sergei de Jonge's school of lutherie. From there, he went on to build his own line of custom steel string guitars. Wayne has been married to Julie for 32 years, together they have 4 adult children. Reuben Forsland is well-known for his respect of traditional building methods, but enjoys exploring new design through the use of rare and exotic woods and materials. His philosophy of building a great guitar extends to lives of the people it will touch. Everybody has a story, and while custom building a guitar, Reuben likes to bring that story to the guitar. Or to create a story within a guitar that someone will identify with. Thus, each guitar also comes with its’ own coffee table book telling its story. Reuben has been building acoustic guitars since 2008 and has earned commendations from his peers, clients and high-end retailers alike, on both his craftsmanship and achievements in producing an incredible sound quality. Creating art and music; applying mathematics and physics; understanding sound waves and resonance; selecting and crafting raw wood; mastering hand tools; cooking organic glues; and preparing and applying centuries-old polishes and varnishes... Making entirely hand-crafted instruments is a journey of understanding and creation. Unfortunately it is a dying art in today's fast pace. My name is Karim Hourani, and I was born in Beirut, Lebanon in May 1987. At 25, I took the aware decision that I want to become a luthier. I was lucky enough to meet and study under Maestro Geza Burghardt, for without him, things would have never been what they are now. I studied violin family repair and restoration for two and a half years, french polish and varnish cooking and application, and currently studying violin and classical guitar construction with the same teacher. I find utmost gratification reviving and hearing a once-destroyed instrument or living for several weeks with a few pieces of wood building an instrument. Having been building professionally for almost 20 years, Tony Karol has built guitars for Tommy Emmanuel, Bruce Cockburn and Stephen Bennett. Using the finest materials from around the world, each instrument is handcrafted in his Mississauga shop. Tony also teaches about a dozen students per year in the craft. "I'm Doug Kauer. I have a beard and an impressive flannel shirt collection. I also wear glasses. That makes me a 105% qualified luthier." As a lover of old acoustic music, I specialize in pre-war instruments that are loud, with rich and dynamic tone! I do manouche guitars, resonator guitars, and plectrum/tenor banjos, respecting the traditional construction and aesthetic, but adding my own twists here and there. I have been fortunate enough to apprentice under Daniel López, Jason Romero, and Martin Tremblay. I've also taken luthier courses with Daniel Richter and Sergei Dejonge. I now work in Montreal at the Mile End Guitar Coop. Our guitars are built with only the finest solid woods available - no plys, laminates (layered), or synthetic woods are ever used in construction. We use FSC wood and engage in as much selective logging as possible. This means we like to be there, in the forest, personally taking part. Imagine, when we begin to create your instrument, we begin on the forest floor. Above all, our goal is 'affordable luxury' - we aim to put high-end guitars into the hands of all players. We don't want to build the most guitars. We just want to build the best. Jeff Letain has been a woodworker since the late seventies and shifted his focus to guitars in the late nineties. Maximum playability and the search for a tone and sound quality that excites passion of the guitarist is his main goal. For him, the guitar is a tool that is functional sculpture and the surface a canvas with a limitless field for expression. Passionate about music, entertainment and instruments, I like to reflect my eternal interest in wood and sound. My instruments are entirely built by hand and reveal clean cuts that characterize my well refined style and geometric. This is both a need to create and a need for novelty that I love shaping wood. Marc Saumier started building guitars in 1996, Today his line includes steel string, nylon strings, archtop, acoustic basses, ukeleles and unique instruments such as 12 string nylon string guitars that are mostly made from locally sourced wood. Focusing mainly on sound and playability, Saumier's instruments feature a unique voice, good note separation and a wide dynamic range thanks to the unique and innovative bracing of his soundboards. "My love of woodworking goes back to my childhood. My father was a craftsman and working along side him as a young boy I learned the skills necessary for fine woodworking. After completing my first guitar, I was hooked…I knew this is where I wanted to focus my talents. I found my passion as a luthier – 17 years later I continue to do what I love every day." I began building guitars in 2006. What started out as a fun project and birthday gift to build my own guitar almost immediately became my passion. I have been playing guitar since I was about 9 years old and it's always been an important part of my life. I built my first three guitars under the guidance of Virgil Shouse, my wife's grandfather. I'm so grateful to have been given that opportunity. Once the first three were completed, I decided to begin setting up my own shop at my home. I read every lutherie book and article I could find and scoured the internet for clues. After a few more, I decided to attend the Galloup School for their Technician Course to learn how to make my creations play properly. A few years later, at the Montreal Guitar Show, a friend recommended a book set by a man named Ervin Somogyi. I had no idea who he was at the time, but I read them cover to cover multiple times. My building was really starting to turn a corner at this point. In 2014, I was fortunate enough to have the opportunity to spend 10 days in Oakland, CA with Ervin himself, along with a few other luthiers, to study voicing the guitar. I've been at it for 10 years now and my journey is just beginning. With each guitar new mysteries are uncovered and I'm genuinely excited to continue to grow in this craft. Perinetti Guitars is a one man shop producing some fine musical instruments with classic and exotic Patagonian tone woods. Nicole Alosinac has spent the last 20 years in the guitar industry. She started her career at Larrivee Guitars, honed her skills with Master Luthier Geza Burghardt, repaired instruments at Rufus' Guitar Shop, and has operated her own repair and custom shop since 2003. Thousands of instruments have passed through her hands, and now she is incorporating that knowledge and experience into designing and building her own guitars. These instruments highlight the natural beauty of the woods used, while giving the player a full, dynamic palate of tones to create with. From the start, we set out to build guitars that are classic and timeless. From wood to components and all aspects of fit and finish, we maintain the utmost in quality. Now going into our 13th year, our award-winning line has rounded out to feature a full range of solid body and semi-hollow electrics, as well as hand carved acoustic guitars. The process starts with our obsession in sourcing the top tonewoods available, for use in each and every guitar we build. In order to ensure the greatest quality figuring and consistency throughout our line, we take great pride in hand selecting every piece of wood that goes into each instrument. Our Heritage Series electrics feature Solid carved Flame, Quilt, Burl and Spalt Maple Tops; while our Eclipse series acoustics feature Solid Spruce, Cedar, Khaya, Rosewood and Koa. Our wood vault houses anything and every- thing from Brazilian Rosewood, South American Cocobolo, Hawaiian KOA, African Zebrawood; to any type of Maple you can imagine. Being situated in Vancouver, Canada; we are fortunate to have access to some of the highest quality Maple right in our back yard and we take full advantage. Aaron Foster builds steel string acoustic guitars, primarily with hand tools, in Oakland, California, under the name Queen City, in homage to his hometown of Denver, Colorado. He seeks to create responsive and elegant guitars with an eye towards the beauty inherent in the wood and form of the instrument and an ear for an expressive, articulate, and full tone. He has been building guitars since 2012, first studying lutherie for a year and a half at the Red Rocks School of Fine Woodworking in Colorado and has been playing the guitar since elementary school. 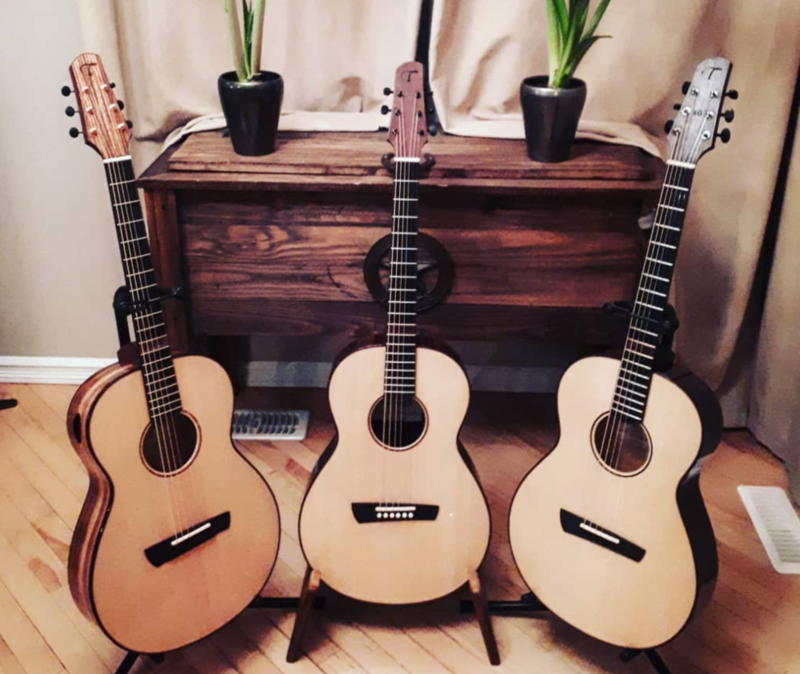 Oliver Duval-Quinn is a member of the Mile-End Guitar Coop since february 2017 and is the sole luthier and founder of Quinn Guitars. Being a Bruand graduate and a Fender certified guitar technician, Oliver specializes in custom designs/mods and quality setups, repairs. Mike Miltimore, a born and raised Kamloopsian is the brainchild behind this state of the art design. Passion Igniter and Founder of Riversong Guitars, Mike is a Master of his trade. Mike’s one and only job since the age of 10 has been in his family’s music business, Lee’s Music, which exposed him to the rich culture of sound and musical instruments. His passion for music and people along with his fiery personality is setting the whole planet a flame. From a early age, Michael Spence had an unending fascination with how electronics and machines worked. Constantly dissecting the world around him, from VCRs to motorcycles, he knew he wanted to pursue a life of building. This attitude, combined with his love of electric guitar, led him to build his first guitar at sixteen. Not having the money for the vintage tones he desired, he soon began building his own tube amplifiers and guitar effects. It was in his early twenties he discovered that his grandfather, Paul George, and great-grandfather, Anthony George once owned guitar-importing company St. George, in Hollywood and New York in the 1960’s. Discovering this lost musical connection to his grandparents, Spence was inspired to start his own electric guitar business. He began building guitars inspired by ones sold by St. George. With an art teacher for a father, I began to imagine, design, draw and build things from an early age. I was especially attracted to the possibilities of working with wood. I soon realized that I could combine my love of art and wood to build custom guitars. This passion, shaped by focused study at Westsächsische Hochschule Markneukirchen and through many years of personal study and experimentation, has made me a professional luthier. As an instrument maker I am motivated by the desire to improve and develop my art, skills and to evolve the idea of what it means to build one-of-a-kind instruments in the 21st century. Adam Turley is an emerging luthier building out of the Clubhouse in Edmonton, Alberta. He builds highly responsive, modern parlour guitars under the tutelage of Dion Guitars. With a longstanding background in high end circular staircases and railings, Turley appreciates a similar marriage between clean and modern aesthetics with excellence in function. Leila Sidi is inspired by the vintage futurism of mid-century electric guitars. She pays tribute to them while accommodating contemporary manufacturing techniques and materials. Conventional and original components generate fresh instruments with iconic tonal character and creative spark. Sidi applies an updated futuristic vision of her craft, conceiving of electric guitars ergonomically suited to musicians of any body type. VIGF is an international showcase celebrating the art and craft of contemporary guitar making, both acoustic and electric. All instruments on exhibit will be available for purchase and custom commissions are welcome. We are presenting the work of master luthiers from Canada, United States, and around the world. Electrics, acoustics, ukuleles and basses will be on display—from the most avant-garde to the staunchly traditional.